NYT: This is Your Life (and How You Tell It) describes a new focus on life stories as a source of information in the field of psychology. The connection between personal myths and identity is a strong one, and in fact the two may just as easily be seen as different angles on the same thing – to use “identity” over “life story” is to speak of state functions instead of a repeated path simulation. I think the state function approach requires more processing. After this article, I went to looked into a few books by the author mentioned, and got the library to order “The Stories We Live By“. Question: Of the bound hydrogen atom eigenstates, which has the highest kinetic energy? Answer: The lowest energy state. Ain’t that curious? Kepler’s laws helped me understand this one. Oh, and this holds for all molecules – I leave the proof as an exercise. In this post – panoramas, MITSFS and Rebiya Kadeer. Last weekend I was obesessed with panoramas. Using hugin, autopano and enblend, I created the first panoramas I’ve ever created, and boy did I impress myself. 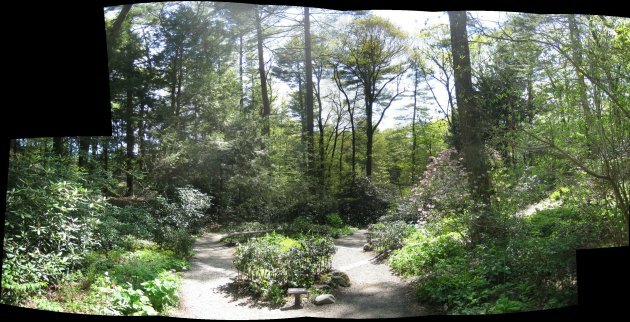 The one below is of Garden in The Woods, a cute little, well, garden in the middle of the woods in Framingham. Some friends of mine had decided to drive there on Sunday, and I tagged along. The rest of the photos can be found in the gallery. David Brin is a pretty established science fiction writer, having won both Hugo and Nebula awards. In this essay he writes about the relationship between the Enlightenment and Romanticism, using Lord of The Rings as context. It is an interesting topic – the appeal of themes drives our behaviour as thinking beings in a way that is on the fringes of free will, neither controlled nor uncontrollable. Brin describes Romanticism as both aiding and rebelling against the industrial modernity brought by the Enlightenment. The two are neither clearly ally nor adversary, which makes the whole thing pretty interesting.